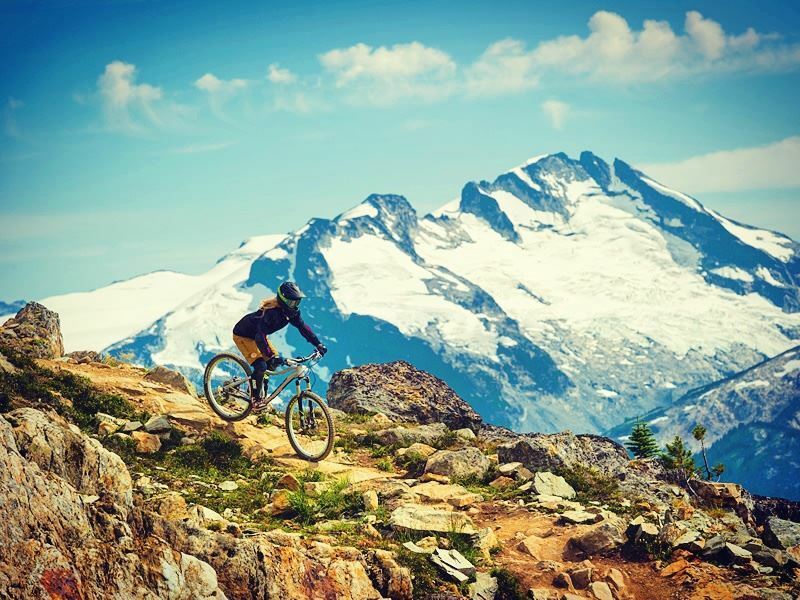 Whistler is one of the world’s greatest mountain biking destinations, a true mecca that attracts legions of enthusiasts to its slopes throughout the summer months. Whether it’s an epic gravity-fuelled descent, a windy cross-country jaunt, or a mellow lakeside peddle, there’s endless variety to be found with something to suit every taste and ability, whether you’re a first-timer or a seasoned rider. 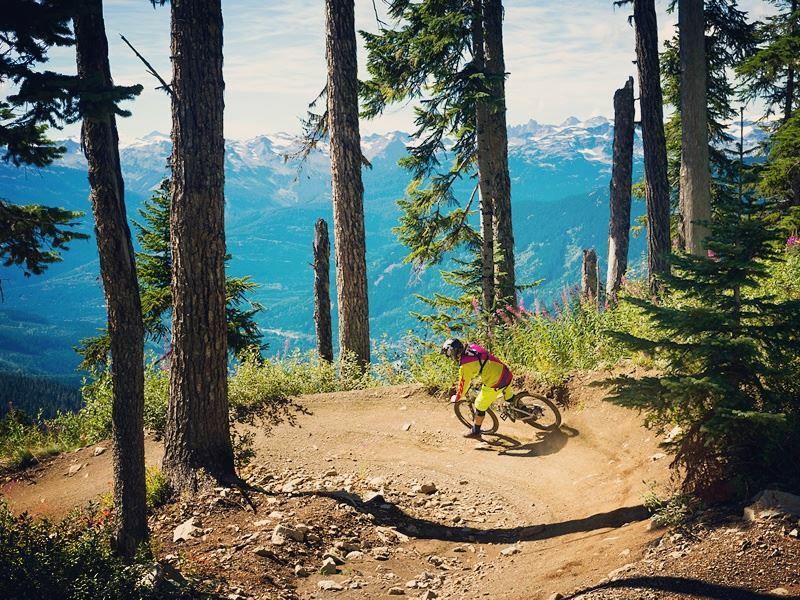 There are two main options when you want to bike in Whistler: head for the world-renowned Bike Park or strike out onto the 250km network of cross country trails that pepper the area. We’ve profiled the top trails in both categories, along with all the information and inspiration you need to get the very most out of Whistler’s biking scene. Whistler is home to the biggest and best mountain bike park in North America, if not the world, boasting a huge collection of exhilarating lift-serviced downhill trails spread over 4,900 vertical feet. From smooth green trails to thrilling intermediate runs, challenging technical descents to gruelling long-distance high alpine routes, Whistler promises a downhill biking experience like no other. The park’s trails are renowned for their great flow, combining this with plenty of interesting features to get those jumps in, from rock faces to table tops and wooden bridges. Freestyle trails are machine-cut and enhanced with man-made obstacles to provide a flowing fun-filled ride. Technical trails make the most of the natural mountain and forest terrain, offering gnarly root strewn lines, rock face jumps and plenty more. Whistler’s 70 plus downhill trails are spread throughout 4 distinct mountain zones, each designated by colour coded markers to indicate difficulty, from beginner to expert level. Fitzsimmons Zone forms the core of the park, home to the largest concentration of trails and with something to suit all abilities. This is the place to come if you are a beginner or simply looking to get oriented. Garbanzo Zone sits above the original Fitz zone, encompassing higher more rugged parts of the mountain and home to many thrilling single-track intermediate and advanced trails. Creek Zone offers an additional base to access the park from, but is mainly suitable for advanced and expert riders only. Finally, Peak Zone represents the pinnacle of Whistler mountain biking, combining endless flowing runs and challenging terrain with superb high alpine scenery. The Whistler Mountain Bike Park is also home to two skills centres, a jump park, drop-off park and the formidable-looking Boneyard Slopestyle Park. If you’re new to the park, or to mountain biking itself, it can pay to enlist the help of a guide to help show you the ropes. The Bike Park offers expert-run lessons at the Orientation Centre and any coach will be sure to instruct you in proper riding technique, as well as point you in the right direction in terms of bike equipment, safety gear and recommended trails. More seasoned riders may also benefit from the extra tuition to perfect existing skills or tackle new challenges around the park. Here are some of Whistler’s most raved about downhill trails, all found within the sprawling Whistler Bike Park. If you’re unsure where to start, the Trail Progression Scale provides a useful guide for riders looking to work their way up through the various trails, according to skill and comfort level. If you’re new to mountain biking, this is the place to come for a gentle introduction to downhill riding. The highly groomed trail conditions means it’s accessible even to complete beginners. More experienced riders will also find it makes a great warm-up run to start the day, especially as it connects to several worthwhile green tech trails. Beginners wanting to get their first practice on a technical trail featuring rocks and roots should head for Del Boca Vista. The route is fast, fun, flowing and has just the right amount of challenge to push you to hone those skills and gain confidence for the intermediate runs. This is one of the finest and most popular intermediate runs in the entire park, providing plenty of opportunity to work on your skills in preparation for more demanding trails. Multiple berms and easy table tops, without any gaps, are perfect for practicing cornering, jumps and getting into the flow of carving good lines. B-Line also provides access to several rewarding intermediate tech trails. This classic trail offers the perfect blend of jump and flow that Whistler is renowned for. With good-sized table tops, sweeping berms, numerous wooden features and thrilling wall-rides, it’s guaranteed to get the adrenaline pumping. Even seasoned riders can have fun carving out creative lines or getting a mid-mountain warm-up in before moving up to some of the harder and faster trails. Moving into the more rugged Garbanzo Zone, Blue Velvet is one of the most popular trails on the upper mountain. It’s also one of the lengthiest, offering a rewarding ride for intermediate and advanced bikers alike. Highlights include sizeable rock drops, wall-rides, plenty of big-flow senders, along with a wooden bridge that can be gapped. Quite possibly the most famous mountain bike trail in the entire world, the epic A-line continues to attract hordes of riders eager to put their skills to the test on this long, fast, flowing trail that’s filled with big berms, huge table top jumps and natural rock drops. It’s rated black diamond and requires a high level of skill to ride. 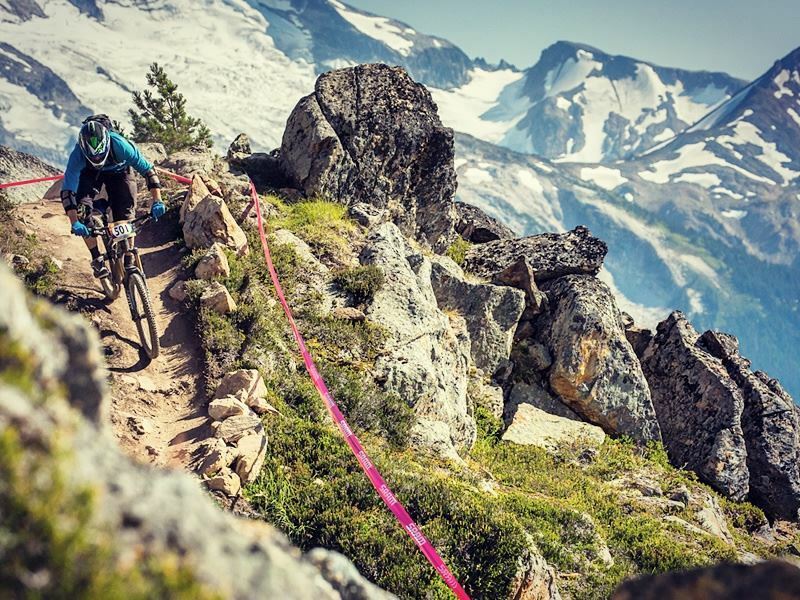 Starting from the lofty heights of Whistler Mountain this mind-blowing high alpine trail links up with the Bike Park (via Freight Train and No Joke in the Garbanzo zone) and eventually deposits riders back in Whistler Village following almost 5,000 feet of single-track descent. The trail itself is a real treat, with smooth flowing tracks filled with berms, switchback corners, rocky sections and fun features. What’s more, it’s all set against the stunning backdrop of the Coastal Range and some of Whistler’s most spectacular backcountry. Top of the World is a lengthy and challenging trail, so if you’re an intermediate rider or tackling the route for the first time, be sure to come prepared and remember it’s fine to take a breather. Perhaps bring a picnic lunch and take a moment just to enjoy those views! 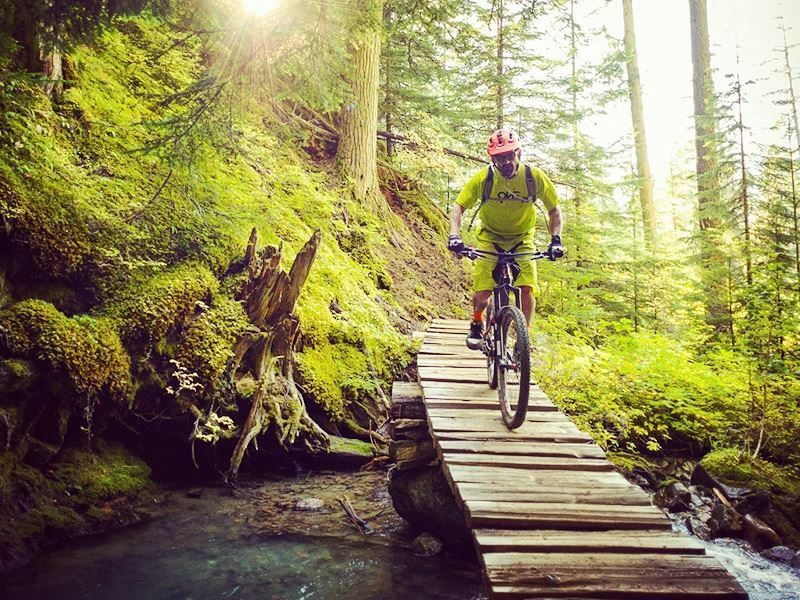 Outside the Bike Park, Whistler Valley and its surrounding mountain slopes are home to 250km of singletrack trails offering up some of the best cross-country biking on the continent. Myriad of trails are scattered throughout the area, encompassing old-growth forests, lake shores, waterfalls, gorges, precipitous rock faces and plenty of stunning views. The Whistler Valley Trail system provides an easy way to access many of the trails. It also makes a rewarding cycling destination in itself for those looking for a more mellow recreational peddle along flat paved pathways. 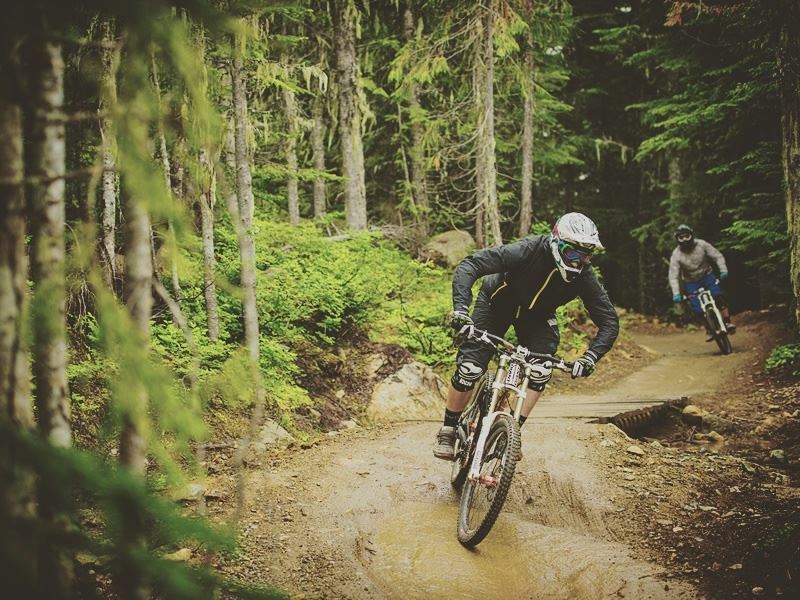 Whether you’re a novice looking for a fun and relaxing way to make the most of the incredible scenery, or a seasoned biker looking for your next big enduro challenge, here are the Whistler cross-country trails not to be missed. The Zappa trails are a collection of easy (paved or gravel) and intermediate (single or doubletrack) routes situated in and around the picture-perfect Lost Lake. Just a 5 minute cycle from Whistler Village and you can access this dense criss-crossing network for hours of exhilarating riding. This is the place to come to get a feel for Whistler’s cross-country trails with something to suit every ability level. Lost Lake also a great spot to relax and cool off with a swim after a long day’s biking. A little further out than many other places, Cheakamus Lake is often overlooked by bikers. Yet these trails offer some of the most scenic views in Whistler, as well as being family-friendly and suitable for beginners up. Well-maintained, gently rolling single-tracks wind through the forest bordering Cheakamus River and Lake, providing a relaxing and picturesque cruise. At the trail end, you’ll need to head back the way you came, but don’t forget to stop first at one of the sandy beaches for a breather, swim and picnic amid gorgeous surrounds. To the west of Whistler lie the Flank Trails, dotted around the eastern slopes of Sproatt and Rainbow Mountains. There’s a real mix of trails here, from steep downhill routes to lengthy xc trails along the valley floor. Many trails link together, making the most of interconnecting logging roads to provide a continuous riding experience. Danimal is a classic piece of flowing singletrack, featuring tight corners, wooden bridges and small drops. Those seeking serious descents should check out Cheap Thrills or Billy Epic for technically challenging terrain combined with outstanding views. This area is home to a couple of challenging trails that are absolute must-rides for technically advanced cyclists. Kill Me Thrill Me is a steep, twisty, obstacle-filled trail offering plenty of thrills and spills along the way, as well as spectacular views over Green River. Meanwhile, Comfortably Numb, which is on the IMBA Epic Rides list, is the longest piece of single-track in Whistler at over 20km and will likely take the best part of a day to complete. It weaves through beautiful old-growth forest, over root and rock filled terrain and crosses several stunning gorges. If you’re a seasoned rider looking for a real challenge, this is the place to come for some of Whistler’s most gruelling yet rewarding xc biking. 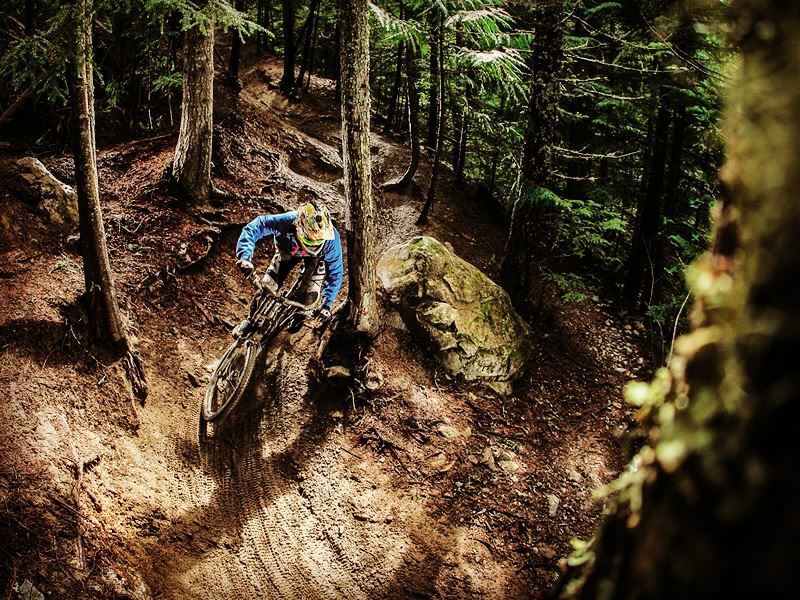 There are several useful maps available outlining all the downhill and xc trails that can be picked up from a Whistler bike shop or viewed online before arriving. Particularly helpful, is a smart-phone friendly database encompassing every trail in the area – the perfect tool to help plan your route or find your way when you’re out and about. If you’re feeling competitive or simply want a way to keep track of your biking (and non-biking) adventures, be sure to check out WB+. This lets you record your mountain stats, measure progress, challenge other enthusiasts and much more. If you fancy taking a break from all the peddling, then head to Whistler in time to catch one of its many renowned cycling events and watch the pros in action. BC Bike Race is a week-long cross-country spectacle held throughout the Vancouver area, with the final day offering an exciting chance to cheer on the riders as they approach the finish line in Whistler. 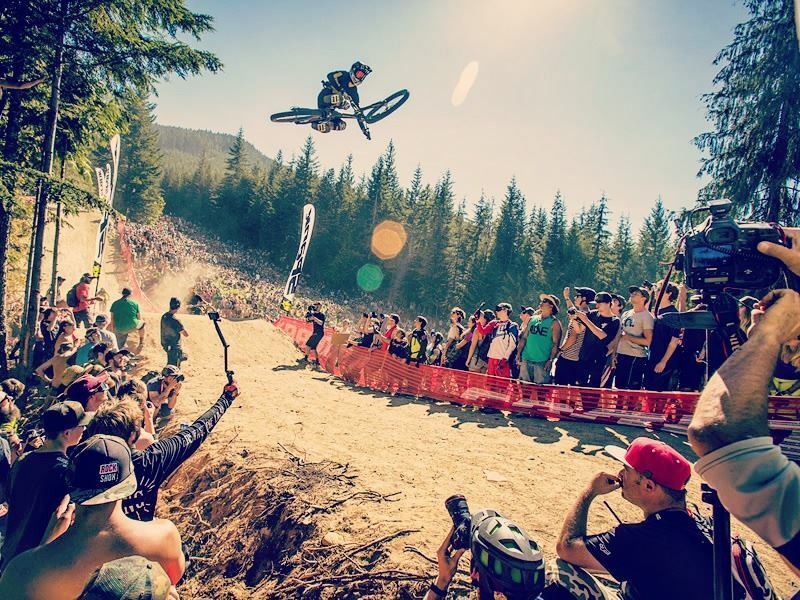 Another one definitely not to be missed is the world-famous Crankworx festival, held every year in Whistler during mid-August. Over 10 days of biking madness, immerse yourself in an endless stream of mountain bike culture and competition. Watch in awe as the pros break out crazy stunts and gravity-defying runs, or join hordes of like-minded fans on the slopes or in Whistler’s renowned après spots to celebrate biking at its very best.